We are the Knights of Dorn! and we are on a hateful crusade. Come with me brothers, and let your hatred be known. I "Cronic McDiper" formed the Black Templars a little over a month ago. Our numbers "online" are 22 by last count, i have a few "veterans" of space marine in the chapter. We also have some new bloods to space marine "360" who have grown since first becoming a Templar. Our first chapter match is set for Jan 25th against the Filthy Few "Wartrolls lot". 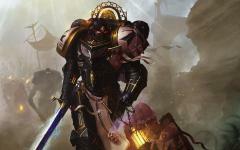 Faith and Fire brothers, the Emperor protects.